I recently had the chance to evaluate an “old school” technology with regard to learning a number of music educational terms and tasks: Cool Cat Cards Complete Music Reading Set. I have to say that I was impressed with their product(s). I had a chance to work with some of the more “advanced” cards with a couple of beginning college music education students and we had a lot of fun working with them and using them. One of the nice things about these cards are that they are well typeset (visually appealing) and durable -unlike many other music flash cards that I’ve seen both on sale as individual items or included with some of the basic theory books. One of the things that we struggle with as educators is finding effective ways to help us help our students recall and recognize specific facts, or concepts. Almost all long term learning must start with the recall of information (or in Bloom’s terminology the Knowledge Category of the cognitive domain). While learning basic music terminology, at the basic level, is sometimes more of a rote type of learning, it is nonetheless the ESSENTIAL foundation to master before we can comprehend, apply, make judgements about, and transfer the concepts to other pools of our overall subject knowledge. I am constantly informing my beginning conduct students about the importance of being aware of all the basic terminology associated with score reading and the associated performance aspects of being a conductor. This acquisition of the these “basics” is no different than any music student starting to “read notes”, learn about intervals, or identify chord structures. Every type of learning aspect starts at the “knowledge” level and expands from there. 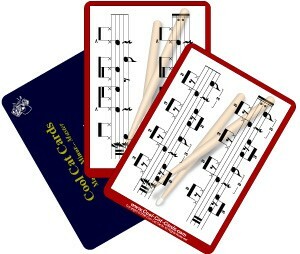 The variety of music flash cards offered by Cool Cat Cards not only covers a lot of music related materials, they are visually appealing, durable, portable, and open up a world of creative thinking to develop learning opportunities for aspiring musicians -all at a very reasonable price (and a 60 day money back guarantee). In addition to offering the basic music sets they also offer card sets for guitar notes (come on! -be a REAL guitar hero!) and percussion rhythm styles. The percussion rhythms are particularly useful for the aspiring set drummer as they include a over 40 standard set rhythms including: Latin, African rhythms, jazz, and rock. If you are looking for a durable, useful, and versatile classroom learning accessory these cards might be “old school” but they will get the proverbial “job done”. Whether your a teacher, parent of an aspiring musician, or an aspiring musician yourself -these cards are worth a look.